The Republic F84F Thunderjet fighter-bomber was one of several high speed aircraft involved in flight research. In this historical photo from the U.S. space agency, the Republic F84F Thunderjet fighter-bomber is seen in the 1940s. The Thunderjet was used by the United States Air Force as one of several high-speed aircraft involved in flight research. This one was at the NACA Ames Aeronautical Laboratory (now, Ames Research Center) at Moffett Field, California. 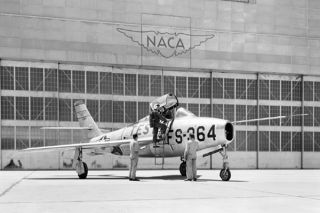 The National Advisory Committee on Aeronautics (NACA) was a precursor to NASA. NACA was created by Congress in 1915. After a series of engine and structural problems that kept the plane in limited use, eventually the F-84S because the primary strike aircraft for the Air Force during the Korean War. Instruments inside the aircraft recorded data on the F84F’s aerodynamic performance as it was flown by a NACA scientist-pilot through a carefully planned research program. Later this data was anyalyzed and interpreted by NACA scientists and reports based on their findings will provide valuable information for designers of future aircraft. NACA (now, NASA) is the independent federal government agency responsible for research into the problems associated with flight.